Self Portrait. AKA Lily the Pink! Are you a Textile Tart? Could you be true to only one genre, or do you like to play the field? Perhaps you are a serial monogamist, or yet again, you may be blissfully happy, wedded to a single calling. Wild and wonderful wacky waistcoat making - this even led to a series of workshops given across the county, some years ago; and for a while I became known for my naive folk art quilts, and again, taught classes on the subject. Then I was off - experimentation was the name of the game, and I became - briefly - a Textile Artist! Yes! It's true! I was a member of a bone fide Quilt Art group, Anglia Textile Works, which is an excellent body and goes on from strength to strength. With ATW I exhibited in Churches, Arts Centres and Galleries, - and even sold one or two pieces. But I always felt somewhat bogus, to be honest, and I left the group, quite amicably , several years ago. For a while I stopped stitching. My sewing room became a depository for anything which didn't have a home and made me feel even less like going in there. Then I discovered PAPER and zoomed off down a blind alley to pursue journalling, book making, paper making, stamping, and a myriad other things to do with mixed media. Then a friend told me firmly I had played around long enough, time to get back to stitch, and took me to a delightful Janet Bolton workshop. Picking up cloth, needle and thread once again was like coming home. And working on a small scale such as Janet has perfected was somehow so satisfying. Janet is, of course, an artist, and is so well known her workshops and books have spawned a plethora of pale imitations of her work - my own included. I love making these small stitcheries, they are just so .....complete in themselves, is the only way I can describe my feeling for them. Once back into my sewing room I began making quilts and other stitched items, samplers, hangings, and so on. 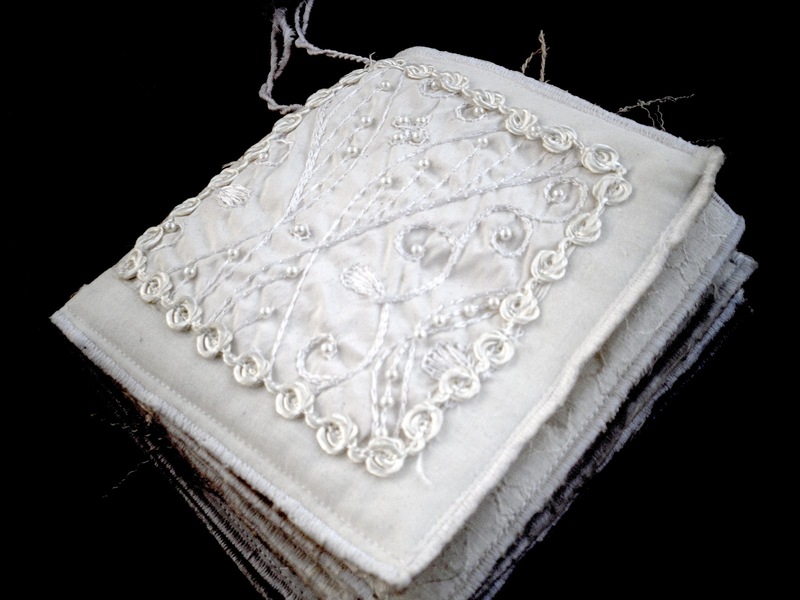 Oh, and while I'm in confessional mode, I have to mention a prediliction for beading and other embellishment, and admit to ongoing but superficial flings with rag-rugging and crochet. Oh dear, it's all looking a bit sleazey, isn't it? And we haven't even been near machine versus hand quilting, applique versus pieced quilts, tradtional versus contemporary, indigo dyeing and shibori, bag making, hats, scarves and cushions. I know, I know, you faithful types are probably pursing your lips in disgust at my profligacy. I can say only one thing in my defence: no experience is ever wasted, and I have learned a lot along the way. Oh, ok, that's two things. So, yes, I guess I am an unrepentant Textile Tart, and my life has been all the more colourful because of it. How about you? Leave me a comment and let us all know! Yes, very elderly! So elderly, in fac, that my hair was well on the way to grey - but with the magic that is 'a good hairdresser' I am back to my lustrous natural colour! Hi Lynne. Thanks for the comment on my blog - it nice to find other people making beautiful things in Norfolk! I'm a complete craft tart - I'll try my hand at most things. Quilting, crochet, knitting, paper stuff, jewellery - jack of all, master of none! Love what you make, so creative! Look forward to reading more too! Hi Claire, thanks for visiting - and commenting. SO glad you are a TextileTart too - and I am relieved to know there are others of us out there. Will definitely be popping back to yours; I wish there was a way to be more in touch with other Norfolk crafter-bloggers, what do you think? Hope that Helps! Let me know if you have found any others.